IT presents its vision for a great casual dance party with this years installment of the "Cannonball" series. 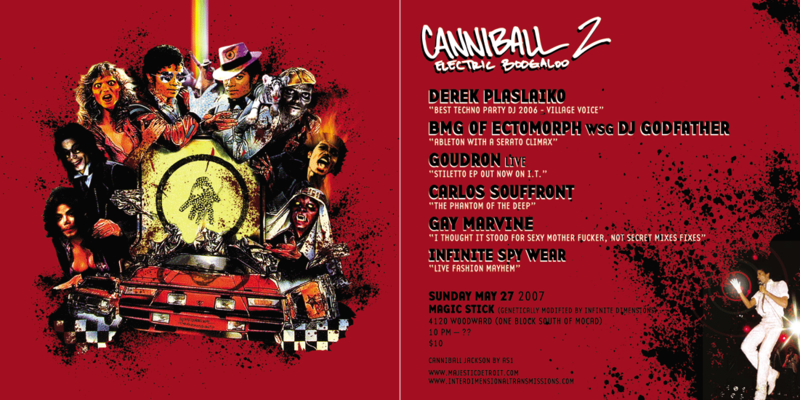 Well I already killed Cannonball (with Sal P from Liquid Liquid) in 2004, and it has been undead since. First it was the Death Wish (with IBM & Serge), then the zombies came to play at the original Canniball (featuring Shake), and this year the cast went to visit the set of the Thriller video, as visualized by AS1. Elements of the party to include NYC's #1 Party DJ Derek Plaslaiko, Goudron (live), BMG of Ectomorph performing with DJ Godfather, Carlos Souffront, Chuck Hampton, and a fashion show from Infinite Dimensions & Spy Wear. Since the people who had that loft apartment on Milwaulke hated having all of you in their bathroom and the forces of evil stole Oslo from us, we are having our fun at the Magic Stick this year. The Stick will be shrunk into a more intimate setting by the installions of Infinite Dimensions.